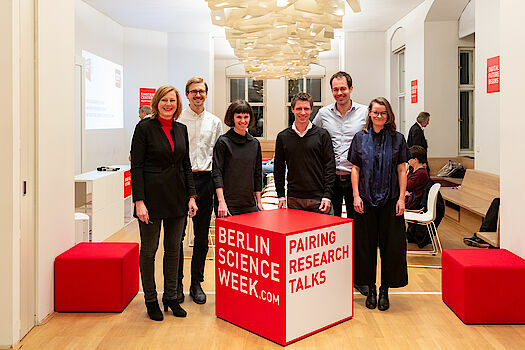 Fascinating and entertaining insights at the Pairing Research Talks: Five professors of the Einstein Center Digital Future discussed their research during the Berlin Science Week. The interdisciplinary format brings together young scientists whose topics have nothing in common at first glance. Prof. Dr. Dr. Felix Balzer (Charité - Universitätsmedizin Berlin/ECDF) presented what the intensive care unit of the future could look like. Instead of bright light and loud devices, LEDs gently illuminate the ceiling and the devices are clad. According to Balzer, these innovations can significantly improve both the healing process of patients and the working environment of the hospital staff. Prof. Dr. Daniel Fürstenau (FU Berlin/ECDF) presented a self-assessment app that allows patients to give a self-assessment of their condition. "Digital technologies offer great potential to better involve patients in health care," he said. Prof. Dr. Berit Greinke (UdK Berlin/ECDF) researches and develops electronic textiles. She opened a new world to the audience with futuristic clothing designs. In the discussion with moderator Prof. Dr. Gesche Joost (UdK Berlin/ECDF), the three scientists developed ideas on how wearable technology could help with patient follow-up. The three agreed: The view of colleagues from other departments on their own research brings new impulses and is a great enrichment. The second talk was opened by Prof. Dr. Helena Mihaljević (HTW Berlin/ECDF). The Data Scientist deals with networked mobility: How can means of transportation such as bicycles, buses, trains, taxis, sharing services and on-demand public transport be meaningfully networked – for example on a mobility platform? "Multimodality and intermodality need a better usability," she said. This can be achieved through data science, in which, for example, external factors such as weather and major events are taken into account. Mihaljević raises the question of how algorithmic decisions can be made transparent for the user. Prof. Dr. Timm Teubner (TU Berlin/ECDF) is also dealing with this question. He conducts research in the field of "trust in digital services". What creates trust on online platforms? What is the economic value of online reputation? How can reputations be transferred from one platform to another? In the interview with Prof. Dr. Gesche Joost, it became clear how difficult it is for young scientists in particular to access data sets in order to research these questions. There are greater reservations in Germany about sharing data than in Anglo-Saxon or Scandinavian countries. On the other hand, there is already Open Data that they could use and cooperation with companies that make data available to them. However, both also made clear that data protection and transparency regarding the use of data are of great concern to them.